Experience box proposes outdoor activities for large groups looking for adventure, adrenaline, fun, challenge and team building. We would spend half or full day in a venue specially prepared for you to enjoy an unforgettable day, and make sure ALL participants go beyond their fears. It's an adventure park in the Heart of Nature where YOU have the star role in your own event totally respectful of nature and the natural surroundings. Our park is the Great Outdoors and enable EVERYONE to enjoy a tailor-made adventure, regardless of age or physical condition, in such a way that you can personally decide on the multi-adventure circuit in which you would like your own adventure to take place. The games, grouped according the level of difficulty in the multi-adventure circuits (similar to ski slopes: green-blue-red-black) are adapted so that everybody can set their own challenge..
A great way to create team bonding and face different challenges of speed, agility and balance in surroundings that are absolutely safe and in a natural, untouched setting. 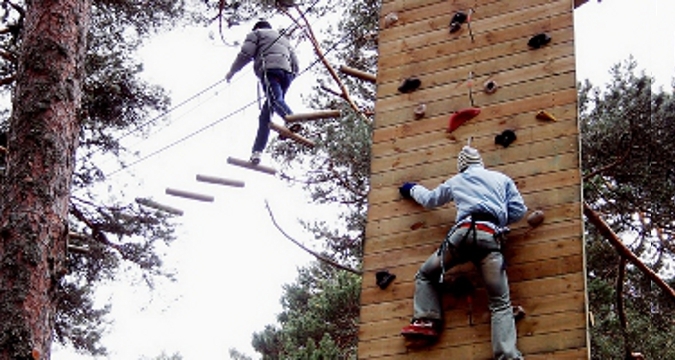 The "go Ape" climbing circuits in Marbella are available to groups of 10 to 200 persons. We propose circuits for all types of fitness levels, making it a great adventure for all of you.